It's dusk in the countryside, and in the fading golden light a small, winged shape takes to the air over a local cornfield. Darting this way and that, the creature executes maneuvers far beyond what any modern fighter jet could manage. The bat is on the hunt for insects, and according to new research, farmers have a billion reasons to be grateful for it. Research recently written by former graduate student Josiah Maine and his adviser at Southern Illinois University Carbondale shows that bats play a significant role in combating crop pests, saving up to $1 billion a year in crop damages. The research article, titled "Bats initiate vital interactions in corn," is published in Proceedings of the National Academy of Sciences. "Bats are voracious predators of insects, including many crop pest species," said Maine, who recently graduated from SIU with a Master of Science degree in zoology. "My hope was that it would give us a much better idea of the ecological and economic impact of bats in agriculture." 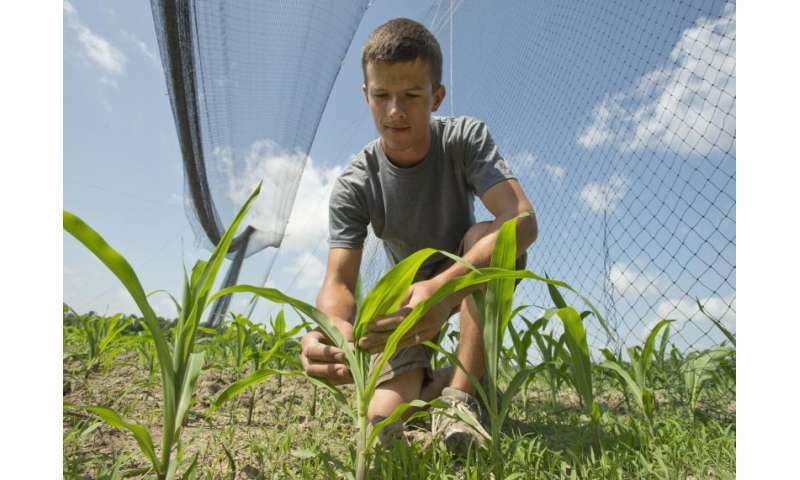 Using funding from the ecology group Bat Conservation International, Maine designed an experiment in corn fields near Horseshoe Lake in Southern Illinois over the 2013 and 2014 growing seasons that would test how corn fared with and without bats picking off various pests. To test the theories Maine built "exclosures" – netted structures aimed at keeping bats outside of them and away from the corn. The exclosures were large, each enclosing more than 4,200 square feet and measuring 23 feet high. Maine constructed the exclosures using steel poles, cables and netting. Keeping the bats out meant pests, such as the corn earworm, were largely free to wreak havoc on the corn crops. But simply keeping bats out would not tell the whole story, as other creatures, such as birds, also were kept out by the structures and away from the pests. "This meant that the exclosures had to be removed daily so birds could forage normally," Maine said. "I arranged the netting so it could be slid on the cables to one end like a shower curtain. This way I could open the exclosures each day and close them each night," before the bats took to the air. "The main pest in my system was the corn earworm, a moth whose larvae cause billions of dollars' worth of damage to corn, cotton, tomatoes, and many other crops," Maine said. "The larvae feed on corn ears, causing direct damage to yield, but they also can introduce an avenue for infection of the corn ear by fungi, which produce compounds that are toxic to humans and livestock. "Bats are known to feed on this moth, but it has been unclear whether they consume enough of the moths to suppress larval populations and damage to crops," Maine said. After analyzing the results, Maine said he found nearly 60 percent more earworm larvae inside the exclosures – protected from the hungry bats – than in the unprotected control areas. He also found more than 50 percent more corn kernel damage per ear in the corn inside the exclosures. Further, he found the damaging fungal growth associated with pests was significantly higher on the corn inside the exclosures, and that the toxins produced by the fungus were much more concentrated in the corn inside the exclosures. Bats also provide a natural solution to pests, which in turn provide additional value to agriculture by suppressing toxic fungi and reducing necessity for costly insecticides, Maine said. Working under Boyles' guidance, Maine said the results of his experiments supported his adviser's earlier research and further quantified it. "My study provides strong support for the idea that bats provide valuable services to society," he said. "By consuming crop pests, bats have tremendous ecological impacts in crop fields. Based on the difference in crop damage I observed, I estimated that bats provide a service to corn farmers worth about $1 billion globally. Bats likely provide additional value to agriculture by suppressing toxic fungi and reducing necessity for costly insecticides." Boyles, who is extensively involved in bat research all over the country, also hailed the study and its implications. "It highlights the importance of maintaining a healthy and high-functioning ecosystem," Boyles said. "Bats are much maligned, but deserve protection if for no other reason than the ecosystem services they provide to humans." Boyles credited Maine with working hard to find answers. "He is an outstanding student and would have been a superstar at any university," Boyles said. "Josiah's productivity far and away exceeds his peers."